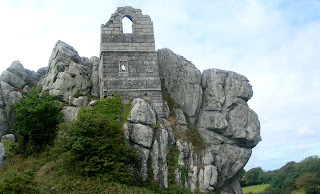 The picture on the left shows the dramatic form of Roche Rock in Cornwall -- an isolated granite outcrop surmounted by the ruins of a fifteenth century chapel. The photograph was taken by Paul Jackson in September 2006... and by coincidence, in exactly the same month Roche Rock was featured in the "Fortean Traveller" section of Fortean Times (issue 214). Noticing that the right-hand side of the rock looks a bit like an ape's head seen in profile, Paul decided to submit the photo to FT's Simulacra Corner ("We are always glad to receive pictures of spontaneous forms and figures, or any curious images"). FT declined to print Paul's photo, on the grounds that it was too vague and indistinct. Fair enough, you may say... but then a few months later, in May 2007 (issue 222), they did print another reader's picture of Roche Rock in Simulacra Corner... and it was even less convincing than Paul's! It's the head of Abraham Lincoln, lying face up, with his feet to the left. And wearing 3D glasses. Well, it takes a few seconds for it to spring out, but you're absolutely right -- well spotted!